We all hope that our children will be good readers. Once you see that love for reading begin to spark, most of your education fears melt away. If they love reading, they will learn. I absolutely believe that they will, but I also believe that it is important to learn to properly comprehend what you read. Sometimes we get caught up in the pleasure of reading in the moment and end up missing half of the details. A love of reading can be deepened by learning to slow down and analyze the details. Unfortunately, a love of reading can also be squashed like a bug if you force a child to dissect everything they read until it becomes dry as dust and all pleasure cleanly swept away. Knowing this, you'll understand why teaching literary analysis can be a little stressful for those of us who second guess every choice we make. In my opinion, it is necessary to teach students to analyze well on a few things so that they can take those skills into their personal reading time. No one is ever going to read a book for pleasure and wish they had some comprehension questions they could answer at the end of each chapter, but whether they want to or not, students that have been trained to pay attention to details won't be able to suppress the skill even when reading for pleasure. My method for this has been to include a class on Literary Analysis in the 9th and 10th grade with a book called Perspectives of Life in Literature. It wasn't intended to be a two-year book, but we take it slow to hopefully prevent choking the fun out of reading. It does ask some of the typical formal-education questions you remember from high school, you know - the ones that made you cry? "What does the author's description of the rocks tell you about the main character's soul?" Pardon? I've recently discovered another option that we are currently enjoying and that is reading with Study Guides from Progeny Press. These guides give an in-depth study of comprehension and they also encourage Christian application. I appreciated the Christian perspective provided. 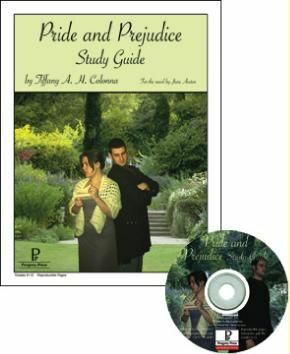 The creators of Progeny Press are Christian homeschooling parents who created these guides with their own children in mind as they began to study classic literature. Their guides are for all ages, even a study on Frog and Toad for very young students! they are available as books, CD's, and email PDF downloads. I prefer the download so that I can print as many as I need for each of my students as they take their turns in Literary Analysis. Each guide contains a synopsis of the book, an author's summary page, and then comprehension activities and questions. It will take around 8-10 weeks to complete the guides and their accompanying books, which is longer than we would usually dwell on a reading assignment, but these are really a separate language arts class all on their own. Joel, my 6th grader is working through Elizabeth George Speare's The Bronze Bow, using a study guide by Carole Pelttari. This is his first taste of literary analysis and he is finding it a bit challenging. The guide does not have you read a chapter and then ask questions. It is broken up into sections that include multiple chapters, requiring quite a bit of re-reading. The first lesson is on Chapters 1 & 2 and instructs students to "Reread the first two paragraphs fo the book." This is a common instruction and Joel found it a bit wearisome. He enjoyed each chapter the first time. The second and third time, not so much. Lesson 2 is on Chapters 3-5. Lesson 3 on Chapters 6-8, and so on. While that was a bit tiresome for him, it was also eye-opening. The guide includes excellent vocabulary study, using multiple choice, matching pages, and crossword puzzles. The lesson instructions asked basic, helpful questions such as "Why does Simon come to visit Daniel?" but it also has students research background information For instance, several bible characters are mentioned in the story and the study guide has students stop and look up scriptures to better understand who these characters are and how they influence the history behind the book. The guide really makes students stop and examine the text and its background. For instance, a Dig Deeper question instructs students: "Joel's father tells Daniel, "God has not spoken His final word. Until He does, it is our part to endure." Read Matthew 24:4-13. List the things Jesus said His followers would need to endure." Now THAT is literary analysis! I love Pride and Prejudice and chose it to go through for myself and for my son Ethan who is in the 9th grade. He walked in on too many Pride and Prejudice movie marathons during his younger years and he is sadly jaded about anything Austen. All the same, it's good for him and I'm hoping a deeper examination will teach him some appreciation for this beautiful book. Pride and Prejudice isn't a flat, cheesy romance. It has wit and humor and excellent character lessons. The guide helps flesh this out for readers as it encourages a deeper examination. The guide does not waste time with questions like "What color is her hair?" Instead, you have deeper questions such as "The opposite of a foil in literature is parallelism, purposefully using similar plots, characters, or other story elements to draw attention to and reinforce specific attributes, ideas, or patterns. In what way is Darcy's outward attitude toward Elizabeth a parallel with Jane's outward attitude toward Bingly. What is also ironic about the parallels?" And yes, there is an answer key. "To teach our children to think clearly, to understand literature, to rely on the scripture for truth and values, and enjoy themselves while they do it!" I feel the guides accomplish this mission. For more great reviews of this product, be sure to visit The Old Schoolhouse Magazine's TOS Crew. I received this material in exchange for my honest opinion as a member of the TOS Crew, and received no other form of compensation. For whatever they're worth, the opinions are mine and mine alone, as stated in my disclosure policy.